minimum order amount required ! 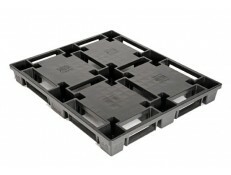 Lightweight, stackable, and nestable plastic skids that blends traditional pallet safety with economic re-use. One piece design lowers costs and eliminates assembly fees -- saving time and money! Clicking "Add to Cart" will add the minimum order amount required ! Re-usable heavy duty shatterproof pallet with a 3yr guarantee. Available in multiple colors. 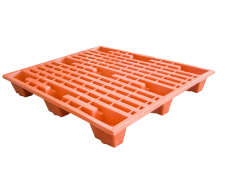 Our plastic pallets are molded of a strong, high-density polyethylene plastic, and can be easily steam cleaned making maintenance a snap. Since they do not absorb water, this material makes it a superior product to be used in freezer operations. Common plastic pallet applications include use in food & grocery (resistant to insects, bacteria and fungi), automotive manufacturing, rubber production, commercial printing & publishing, and many other industries. Our products are durable, easy to nest, and of a rackable design. Being constructed out of recycled materials, our plastic pallets promote the discussion that your business is environmentally friendly. We also offer a lighter export grade that is intended for one time use, making it a more cost effective shipping option. 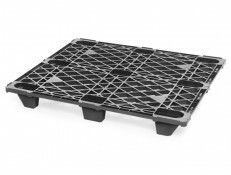 Durable plastic pallets are designed for repeat use, making them ideaal for heavy industrial applications, and can be utilized as a closed loop distribution pallet solution. Export grade pallets are typically intended for one-time applications, making them a low-cost shipping option. Nesting pallets are designed to fit into a stable stack, freeing up valuable floor space when not in use, and make transporting them to a new location an easier task. 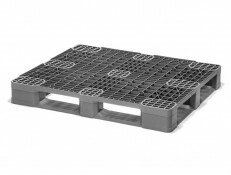 Rackable pallets can distidute the weight of their loads across an open span, and are utilized in open pallet racks. Pallet colors include black or grey. CALL 1-888-598-9060 today to discuss your application of our fine product! Sign up for our e-mail list below, and you’ll receive special discounts and pricing in the future. © 2019 SKIDS.COM. All Rights Reserved.